When exploring how members of a healthcare team are interacting with patients in the pursuit of an improved healthcare system, it is likely that multiple layers and complex relationships of an organization’s infrastructure will need to be examined. While our expertise lies in the realm of patient-provider interactions, we would be remiss if this series on patient satisfaction did not touch on the importance of employee satisfaction. In the last blog, we discussed how health outcomes may be influenced by patient satisfaction, and how this satisfaction may be influenced by communication. However, in order to integrate a patient-centered communication approach effectively, healthcare workers must also be adequately engaged in their workplace, mission, and job functions. We explore the parallel between what patients want and what employees want, and how solutions for both may be interconnected. Referring back to the Hospital Consumer Assessment of Healthcare Provider and Systems (HCAHPS), a recent Press Ganey study found that hospitals scoring in the top 10% of employee engagement scored an average of 61 percentile points higher on the HCAHPS than hospitals in the bottom 10% for employee engagement.1 The Gallup organization, which originally coined the term “employee engagement”, defines engaged employees as those who are involved in, enthusiastic about, and committed to their work and workplace. 2 With this definition in mind, it is apparent at first blush how an engaged employee might be better suited to engage in effective patient-centered communication. Multiple sources confirm this hypothesis. For example, in a report from the American Medical Association, better patient experiences and higher quality measures are linked with hospital characteristics like strong teamwork, organizational leadership, and a commitment to improvement. 3 A recurring theme is that if the staff are satisfied, there seems to be an effort to better interpersonal communication, which allows for better engagement with patients. Transversely, the opposite is true; in a study with social workers, researchers found that work-related stressors such as individual experience conflict, role ambiguity, or work overload led to job burnout and employee disengagement.4 And to continue these study implications to the next level, data from a meta-analysis showed statistically significant negative relationships between job burnout and safety. In other words, these findings make the case that greater burnout among healthcare providers was associated with poorer-quality healthcare and reduced safety for patients. Employees want better communication from their management team. In a Harris poll with over 1,000 U.S. workers, employees called out management offenses.9 Interestingly enough, although truly noxious behaviors such as micromanaging, bullying, and narcissism were on the list, the top three complaints were: not recognizing employee achievements, not giving clear directions, and not making time to listen to employees – all of which fall into the “effective communication” bucket. There is encouraging news, however. There are employers who have been recognized for excelling in their engagement strategies – implementing policies and interventions to create a culture where they double the current rate of employee engagement.6 In the healthcare world, there are multiple ways to approach this objective. Right-staffing (matching patients with the right staff to meet their needs), managing overtime, acuity-based staffing (staffing based on the number of nurses on a shift according to the patients' needs, and not according to raw patient numbers), and interdisciplinary rounds to discuss psychosocial and emotional aspects of patient care as a team, are a few of the metrics and approaches considered in determining and influencing employee engagement and satisfaction.1, 10 Healthcare organizations are taking notice that having more engaged and satisfied staff directly relates to having more engaged and satisfied patients which, in turn, results in better quality care scores. In addition to these approaches, it can be quite helpful to provide a practical and relevant communication training for staff and management alike, designed to address both the needs of employees and patients. 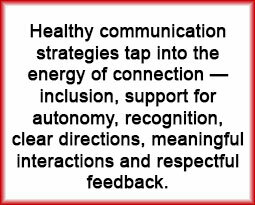 In other words, teaching healthy communication strategies that tap into the energy of connection — inclusion, support for autonomy, recognition, clear directions, meaningful interactions and respectful feedback. It’s like getting two for one: managers model effective communication skills for employees, who then practice them with patients. In our next blog article, Part 4: Communication: Where It All Begins (and Ends), we discuss this topic in more depth. The healthcare industry is also becoming a more competitive business, dependent on successfully gaining and keeping customers; i.e. patients. Like any business, there are infrastructural11 In summary, before putting significant resources into an intervention that is limited to effective patient engagement strategies for line staff, it may be helpful to assess and address your culture and employee satisfaction in order to effect sustainable change in the organization with more meaningful interventions and results. 3 Patient Satisfaction Reporting and Its Implications for Patient Care. AMA J Ethics 2015;17(7):616-621. 4 Travis DJ, Lizano EL, Barak MEM. “I'm So Stressed!”: A Longitudinal Model of Stress, Burnout and Engagement among Social Workers in Child Welfare Settings. Brit J Social Work 2015;46(4):1076-1095. 8 Bhatnager K, Srivastava K. Job Satisfaction in Health-Care Organizations. Ind Psychiatry J 2012;21(1):75-78. 10 Lown BA, Manning CF. The Schwartz Center Rounds: Evaluation of an Interdisciplinary Approach to Enhancing Patient-Centered Communication, Teamwork, and Provider Support. Acad Med 2010;85(6):1073-1081.